The world of Thalu is brought to life through Virtual Reality (VR), in otherworldly surroundings guided by the concept art of cult favourite and graphic artist, Stuart Campbell. The VR experience is a dazzling series of linked worlds filled with fantastical, high contrast, neon-lit Australian landscapes and wildlife. ‘Thalu’ in the Ngarluma language means, ‘totem’. However, the English word cannot fully describe the layers of meaning that “thalu” conveys to the Ngarluma people. 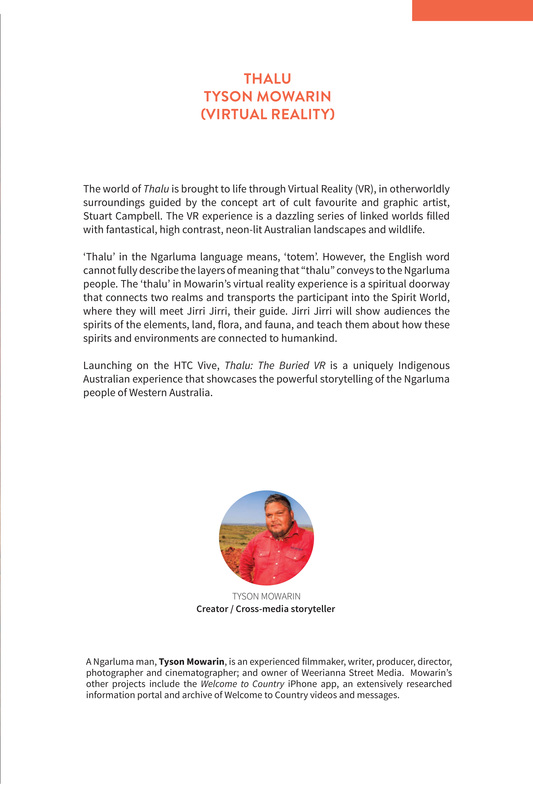 The ‘thalu’ in Mowarin’s virtual reality experience is a spiritual doorway that connects two realms and transports the participant into the Spirit World, where they will meet Jirri Jirri, their guide. Jirri Jirri will show audiences the spirits of the elements, land, flora, and fauna, and teach them about how these spirits and environments are connected to humankind. Launching on the HTC Vive, Thalu: The Buried VR is a uniquely Indigenous Australian experience that showcases the powerful storytelling of the Ngarluma people of Western Australia. A Ngarluma man, Tyson Mowarin, is an experienced filmmaker, writer, producer, director, photographer and cinematographer; and owner of Weerianna Street Media. Mowarin’s other projects include the Welcome to Country iPhone app, an extensively researched information portal and archive of Welcome to Country videos and messages. Mowarin, Tyson. 2018. “Thalu: Virtual Reality”. In Decolonising the Digital: Technology As Cultural Practice, 146-57. Sydney: Tactical Space Lab. http://ojs.decolonising.digital/index.php/decolonising_digital/article/view/Thalu.